A beautiful book crammed with exquisite details about our universe and everything in it. 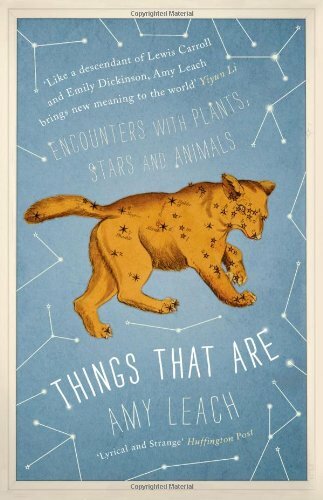 The subtitle is Encounters with Plants, Stars and Animals, and in this collection of poetically observed scientific essays, Stars really do seem like just another bobbling entity, not that dissimilar to a whirligig beetle, a baby penguin (which she describes as a “pear-shaped bit of fluff”) or a biscuit starfish. I found myself entranced by the juxtapositions Leach throws together – drawing unexpected connections between tomato frogs and bears and grass (they all prefer to live in light) or between man-of-war jellyfish and Leo Tolstoy (both resembling, she asserts, a single entity while actually being made up of many). Moments of surrealism gather you in – there’s a whole section on sirens, were “free like thunder, and dangerous like tornadoes, and enchanting like fire” and who used to sing songs “people would follow to the other side of life” and now forced into service as Emergency Warning Sirens sounding the alarm.